Our custom application equipment is used for both lime & fertilizer spreading. Terry Shearer, the principle operatory has several years of experience and uses GPS to reduce skips and over-application. We can create a GPS application record, on large fields, that will create a map and keep records for what was applied. The dry application lineup consists of 2 tandem spreaders, 2 floaters, one which is equiped with a Viper Pro that allows us to variable rate, and 10 trucks feeding lime and fertilizer to them in season. Our equipment and man power allows us to provide the superior service we have during the spring rush. Application on reclamation areas, land fills and gas wells are other examples of what we can do with our equipment. 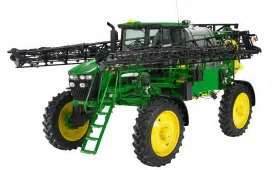 In 2012, we added on our John Deere 4830 sprayer. It has 100 foot booms and allows us to get over taller crops than our previous machine. We service 6 counties in Western PA and Eastern OH!